comprises about 900 species of both evergreen and deciduous trees and shrubs, which are characterized by alternate simple leaves with pinnate venation, unisexual flowers in the form of catkins, and fruit in the form of cup-like (cupule) nuts. 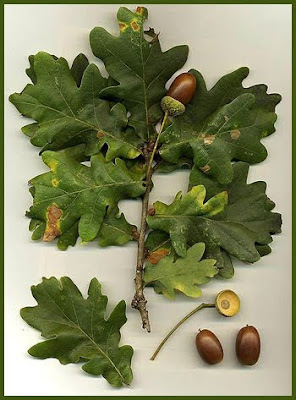 The best-known group of this family is the oaks, genus Quercus, the fruit of which is a non-valved nut (usually containing one seed) called an acorn. in the genus Quercus, of which about 600 species exist on earth. The flowers are catkins, produced in spring. The fruit is a nut called an acorn, borne in a cup-like structure known as a cupule; each acorn contains one seed (rarely two or three) and takes 6–18 months to mature, depending on species. Let us look at some types of Japanese oaks (kashi 樫) and their kigo. the cherry blossoms . . . Written in 1685, when Basho visited Mitsui Shuufuu 三井秋風 Shufu at Narumi. (Shufu - 1646 - 1717) A rich kimono merchant and haikai poet from Kyoto. Basho compares the Kashi oak to his independent-minded host (or rather, vice-versa). Basho often uses the nature around him to imply a human condition also just now around him.
. nara momiji 楢紅葉（ならもみじ）Nara red autumn leaves . This hokku is from the end of the seventh month (early September) in 1823. Japanese oak leaves fall off not in early winter but in summer, when new green leaves appear; a "winter oak" keeps its brown leaves on its branches, and the leaves make uncanny sounds in the wind while the limbs of other deciduous trees are bare. Because oaks normally keep their fairly large leaves in winter, they were widely believed to be the trees in which the tree-leaf protector god (hamori no kami 葉守の神) stayed during the winter months. The gale in the hokku, however, is so strong it rips even oak leaves off their limbs many months before they are ready to fall. When Issa writes a hokku in his diary that evokes a season different from the season in which he is writing, he usually writes the character representing the season of the hokku above the hokku, but there is no such note above this hokku, so it can be taken either as an autumn or a winter hokku. A kogarashi, according to a popular folk etymology, is literally a "tree-withering blast" or cold, dry gale-force windstorm from the north or northwest, can be either a late autumn or an early winter image in both traditional waka poetry and in premodern haikai, though most contemporary haiku saijiki editors usually list it only as a winter image. These powerful windstorms usually begin to blow in late October and continue into December or even later. Issa's diary for 1823, for example, has the first big windstorm taking place late in lunar autumn, on 9/24. A dried sardine, perhaps hanging with several others from a beam in the kitchen or a hallway, seems to have been blown onto the ground, and the wind pushes the sardine against a wall or fence and presses a large oak leaf around it. Perhaps Issa rewrote it because he wanted to use the stronger image of the wind blowing down an oak leaf. The word order in the later hokku is also smoother.
. Withering Wind, Cold Gale (kogarashi 木枯らし) . made from strong local wood　マテバシイ mateba shii oak, Pasania edulis Makino. Geist und Beschützer der Eichen. In the 吉城郡 Yoshiki district of Gifu, the deity カシワの神 Kashiwa no Kami, the Deity of Oak Trees, is venerated everywhere. He is said to use a walking stick and eat rice. He can also suppress an earthquake. Written in 1690, at the end of Genju-An no Ki records (The Hu. Basho stayed with Suganuma Kyokusei 菅沼曲翠　曲水 of the Zeze domaine, after coming back from his long trip, Oku no Hosomichi. Basho visited there from April 1690 till July 23.
" ... I wondered if I would become a Buddhist priest, but I rather wanted to suffer the winds of journey without a definite destination to enjoy nature with flowers, birds, winds and the moon . . . ."
I labor without results, am worn of spirit and wrinkled of brow. Now, when autumn is half over, and every morning and each evening brings changes to the scene, I wonder if that is not what is meant by dwelling in unreality. And here too I end my words. I don’t force myself to love idleness and solitude (kanjaku　閑寂), yet I am like a sick man who is weary of people, or a person who is tired of the world. How is it so? I have not led a clerical life, nor have I engaged in worldly undertakings; I am neither benevolent nor righteous. Ever since I was very young I have liked my eccentric ways, and once I made them the source of a livelihood, only temporarily I thought, I couldn’t put anything else in my mind and, incapable and talentless as I was, I have been bound to this single line of poetry. In the poetry of Saigyô and Sôgi, the painting of Sesshû, and the tea of Rikyû, despite the differences of their talents, the fundamental principle is one. Without knowing, the autumn has half passed as I was pressing my back, rubbing my belly, and making a wry face. Human life is also like this, short as a brief dream. Again, I feel this must be what is meant by dwelling in unreality.
. - Genjuuan　Ki 幻住庵記 Genju-an Records - . In the square where we live, nine oak trees add presénce. It is a joy to watch them grow new leaves in spring and then to watch these leaves fall in autumn. Right now, the branches are draped with snow.
. TREES as kigo . Daruma taking away the pain . 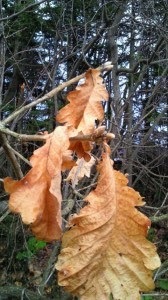 kunugi 櫟 Quercus acutissima - a pun with 苦抜き ku nuki, ku o nuku. In 茨城県 Ibaraki they think the roots of paulownia 桐の木の根 and kunugi and live squid are sending off light when placed in a dark spot. This light is then able to bewitch people. In 真壁町 Makabe village they believe the tree likes to hear the low, painful voice of sick people and therefore never plant it in their garden. In 愛媛県 Ehime there is a custom called トンドさん Tondo san. On the 15th day of the first lunar month people cut kunugi branches and build a small square hat. Inside they place diapers and then roll diapers all around the walls, like flags. Then the whole hut is burend down and the ashes taken to sea, mixed with sea water and then taken home to place at the four corners of the house. This way bad luck and disaster can be avoided for the coming year. "If you plant fruit and vegetables in your garden, you will always have enough to eat!" At temple 海禅寺 Kaizen-Ji in Uwajima someone begun to dig at the roots of a tree sacred to the Heike, a 椎の木. His face became swollen and his extremities limp. This was a curse of the Ochudo. an old man lived a lonely life, his dreams of getting back his former riches never came true. One night he had a dream that he would find riches if he cut down the large kunugi oak tree in a corner of the Shinto shrine. Next morning he went to the shrine, and found the big tree. When he hit it with his ax, from the wound in the tree trunk came a small Daruma doll rolling out. Now the old man realized that he should not follow wrong dreams of riches but live in penance every day and be happy whith what he got. tells of an old tree with no special value and just a small hole among its roots, where the Daruma was sitting. He took the Daruma home and prayed to it every day for guidance to achieve a calm mind. On 用の山 Mount Yonoyama (540 m) there is a shrine for Gozu Tenno 牛頭天王神社, where Susano-o no Mikoto is worshipped. There was a huge カシの木 Kashi oak tree in the compound, which the villagers cut down to build the shrine. But it turned out to become a curse of Gozu Tenno and all the babies and young children of the village died. The villagers heard the sound of someone dancing a ritual Kagura dance and went to have a look, but there was nobody. Eventually a diviner told them that it was the angry Gozu Tenno. He wanted them to get new trees from a different mountain nearby and re-plant them here go get the peace back in the village. A tengu lived at the river crossing and people were not supposed to walk along there at night. If anyone did, the oak trees on both sides of the road would start walking toward the middle of the road and block it. That was the deed of a Tengu. If people apologized, the Tengu would stop the wind and they could climb the slope. The old people venerated the Tengu as Tengoo Sama. Yamanokami 山の神 lives in the stump of an old oak tree. It is a female deity, gets angry easily and is stingy. at "the Mountain of the Princess" there lives a Tengu. He frightens people with loud noises. Once a woman went to the mountain to collect sweet chestnuts, but was frightend away. Tengu like the nara no ki ならの木 Nara oak tree and sometimes the branches look like the beard of a Tengu. kashi no ki カシの木 / 樫 oak tree .